Queen's Day, April 30, was the day of the year the Netherlands turned completely orange. Certainly the most popular festive day for going out into the streets, and having a party outside. 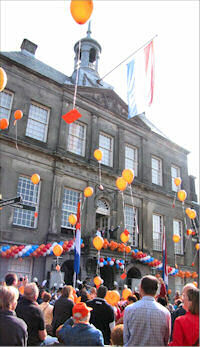 With the coronation of Willem Alexander 2013, King's Day is on his birthday, April 27. Queen's Day celebrated the birthday of queen Beatrix. Well, actually, her mother's birthday, queen Juliana. The birthday of Beatrix is in January. Midwinter, and naturally not ideal for parties in the street. King's Day traditionally starts with the aubade, where the national anthem and a few other patriotic songs are performed by the gathered population, and primary school children. Takes place in every town and village, generally before the city hall. The mayor on the balcony, representing the king at that moment, receives the honours. And sings along as well. Often there's a balloon contest for children at the end, like here in Weesp at our city hall, built 1776. After this more or less official part, there are games for children, concerts and other public festivities. And yes, there's a lot of drinking. These last years unfortunately leading sometimes to unpleasant situations among the giant crowds that celebrate in Amsterdam and other major cities. An immensely popular part of King's Day are the freemarkets. Supposedly these freemarkets are for children to sell their old stuff (and buy a lot of new old stuff). Or children can make music, or perform to make some money. In small towns like Weesp, that's the way it goes. In large cities, parts of the freemarkets are more commercial. 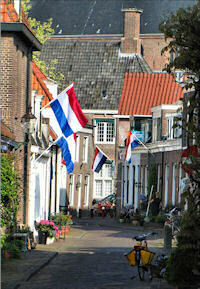 For video clips of King's Day in Weesp and Amsterdam, see the video page. Return to history, general backgrounds on this website.